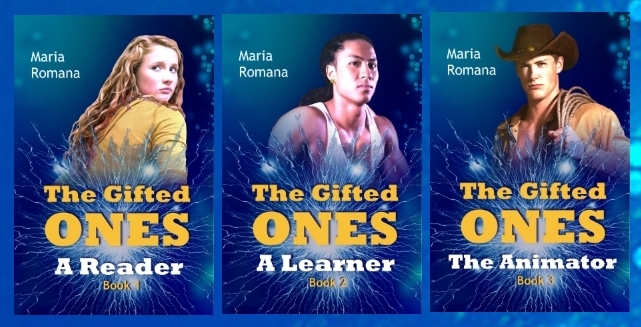 The Gifted Ones is an episodic, romantic suspense series, with each book running 65,000 to 95,000 words in length (250 to 350 paperback pages). Each episode is a complete story in itself, but leaves “dangling threads” to be resolved in later episodes. The stories are chronological and connected with recurring characters, so you will want to read them in order, similar to many action/adventure/mystery series on television. Grace Nagle has seen more than her share of tragedy in thirty-three years, but she’s finally settled into a solitary and quiet life raising her teenaged niece Ellie…quiet, that is, as long as she can keep Ellie in the dark about a certain genetic gift that runs in the family. After Ellie’s frightening encounter with the new boy in town, however, Grace can no longer hide the truth. At first, Ellie is thrilled with her new life and her new, Gifted friends, and even Grace starts to reconsider her lonely existence with so many Gifted men around. But when it becomes clear that Grace’s original fears were not unfounded, Ellie learns that “different” isn’t always better. And sometimes, it means running for your life. Daniel Holybear, a Native American Gifted One, finds himself at odds with a development company that is threatening the peaceful seaside town he grew up in. When the company’s construction project unearths a mysterious stone tablet, Daniel calls on his Gifted friends to help secure the stone and uncover its secrets. Their efforts to assist him, however, are complicated by a peculiar kinship Ellie senses between Daniel and the project’s lovely manager. As the relationship deepens, Ellie finds her Gift bringing more pain than pleasure to those around her, and ultimately leading one of them to the brink of tragedy. Ellie’s Aunt Grace has always had a love/hate relationship with The Gifted Ones. Deep down, she blames them for destroying her sister’s life, so when Doo Clovis, an especially kind-hearted Gifted One, shows her some attention, she isn’t quick to take the bait. When Grace finally lets her guard down and begins to warm to the handsome cowboy and his old-money Texas family, however, she is unprepared for the evil that lurks in the more distant branches of his family tree. The next thing she knows, Grace is found with blood on her hands, sucked into a web of lies and deceit, and must turn to The Gifted Ones to get herself out.